Business people and others will agree that making connections and building professional relationships are vital aspects in developing one’s business and helping it grow. It’s also a piece of advice that’s often ignored or a step that business owners are hesitant to take because they don’t know what’s important and where to start. Networking is effective because people would rather do business with someone they know or were referred to before they trust a company they found through an advertisement, according to Business 2 Community, a business blog that provides leadership advice, along with business/organization exposure and networking opportunities. It all works together. Joining a networking group can also provide enhanced benefits that business owners would pay more money for if they tried to do the same on their own, says Tiffany Menke, the president of the Urbandale Chamber of Commerce. Clint Dudley and his son Henry at the annual Easter Eggstravaganza, which the Grimes Countyline Kiwanis helps sponsor each year. Dudley was a founding member of the Kiwanis club and is also a member of several chambers of commerce, which he says has helped grow his business. Business Networking International. BNI is the world’s largest networking group with local chapters. The organization’s philosophy is that “Givers Gain,” meaning that by giving business to others through word-of-mouth referrals, one will receive business in return, according to BNI’s website. One of the local chapters of BNI, DM-Des Moines, meets Friday mornings in Urbandale. The group has 21 members who give a brief pitch about their business and then work together to promote and pass on referrals to one another’s businesses. The cost to join is $400 a year. Andy Hummel, a sign designer and fabricator at Iowa Sign Co. in Urbandale, joined the networking group about three months ago in the hopes of bringing more clients to the business. He was drawn to the fact that the group is more of a referral business rather than a meet-and-greet-and-see-what-happens event. Hummel’s company has received one business project as a result of referrals from the group, and Hummel himself has found services to use through various networking. Chambers of Commerce. Grimes, Johnston and Urbandale all have chambers of commerce that help business owners market themselves, learn new ways to grow their businesses and create relationships and connections, chamber officials say. The Urbandale Chamber of Commerce has 750 business members. Member benefits vary by member, and the chamber serves a diverse mix of members. About 60 percent are located in Urbandale, Menke says. The Urbandale Chamber also provides educational sessions designed to strengthen a member’s business about topics such as human resources and all aspects of owning a business, and helps its members make individual connections with other businesses to form relationships and connections that can help the business grow, Menke says. The chamber also advocates for businesses on the state and federal government levels, and works to help business grow and others to relocate to the community. The Urbandale Chamber also has subcommittees that business owners can join for an additional fee. These groups include a young professionals group, genYP, and the Member Owners eXchange Ideas and Experience (MOXIE) group. MOXIE allows business owners or presidents to discuss sensitive issues in a confidential setting in order to receive feedback from others who may have experienced similar situations. Many chambers offer business roundtable panel discussions on topics that are relevant to all sizes of business or speakers who discuss a wide range of areas, some of which are not related to business. In addition to events, chambers work to help members promote and publicize their business through referrals, directory listings, website and newsletter advertising, job postings on the chamber website, sponsorship opportunities and more. Menke says Urbandale Chamber members make back their basic level dues of $300 and much more in the advertising package the chamber gives to them with local radio and print ads. The Urbandale Chamber will host the Central Iowa Business Conference in October, which is another opportunity for business owners to network with one another and learn more from experts, including Gino Wickman, the founder of the Entrepreneurial Operating System that is aimed at small businesses and entrepreneurs. Clint Dudley, the owner of Shade Tree Auto in Grimes, has been a member of the chamber for nine years and a board member for seven. He’s also a member of the Johnston and Urbandale chambers and has developed strong business connections and recruited customers through them. Women’s Group. The Chocolate Connection Networking Women’s Group is a unique professional group for central Iowa. It has more than 500 female members, and attendees pay $8 for most events they attend. Events are hosted at locations that are important to women such as Dress For Success, where women shared information about their own business. Usually 35 to 40 women attend from those who are starting their careers to retirees. “It gives them an opportunity to meet other businesswomen in a casual environment,” says Joan Ellis, who organizes the group. Non-Traditional Business Groups. The Des Moines Business Group pegs itself as a more casual networking group that is not affiliated with a national organization. The group meets on Tuesdays each week for lunch at Cupcake Addict in Johnston. The group of 40 members was started more than 20 years ago for those who wanted an alternative to traditional, large networking groups, says Kim Merriam, the president of the group and co-owner of J&K Automotive in Urbandale. Membership dues of $265 are collected annually, and 50 percent attendance is required. Merriam says she has made good connections within the group, and that most of the group members are business owners within a close radius and share business with one another. “We pass business back and forth between each other because we have developed friendships,” she says, adding that this has been critical to her auto service business. Each week group members are given a minute to discuss new happenings within their business. Two members are featured each week and give a 10-minute presentation. The group hosts a golf outing, a holiday party and other events along with an annual membership drive. Central Iowa Business Group. This referral-based, networking group meets weekly. The 20 members are professionals and tradespeople who want to grow their business within central Iowa. Only one person from each professional specialty is able to join the group. The group meets Tuesdays at 7 a.m. at the Iowa Machine Shed, 11151 Hickman Road in Urbandale. 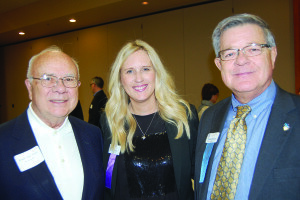 From left: former Urbandale Mayor Don Brush, Lori Gelhaar with the Palmer Group, and Urbandale City Councilman David Russell at the Urbandale Chamber of Commerce’s annual meeting. If you like to volunteer, there are non-profit groups that often draw business-minded professionals. 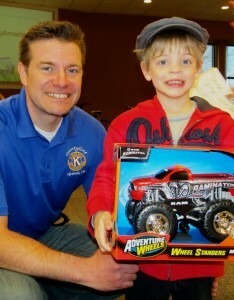 These include local Kiwanis, Optimists and Rotary International clubs. Dudley was a founding member of the Grimes Countyline Kiwanis. “There were a lot of things we wanted to do in the community that weren’t tied to business,” he says. Kiwanis is an international organization that creates opportunities for children and is devoted to improving the lives of children in their community. While involvement with Kiwanis is service related, Dudley’s business has grown through friendships and connections he’s made within the club. He’s been involved since the club started four years ago and has had the opportunity to work side by side with community leaders and get to know them on an individual basis. He’s made connections within Grimes city government and the Dallas Center-Grimes Community Schools. “It has been good for our business, but it really wasn’t the intent of the organization when we first started it,” he says. Johnston and Urbandale also have their own Kiwanis clubs. 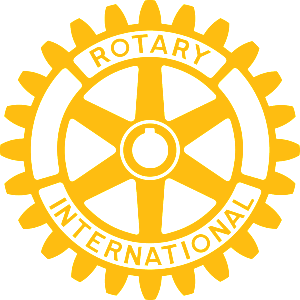 The three communities also have their own Rotary chapters, which focus on service events, where members are able to connect with each other. Some have lunchtime workshops that feature speakers who may speak about nonprofit groups or provide business development advice. Members, whose daily professions include work in finance, education, construction and more, can use this event to network and meet with others. From online discussion forums to business social media sites, the Internet can offer resources to small business owners and new entrepreneurs that can be less expensive and even free. Social media sites such as LinkedIn give business owners the opportunity to connect with others through the creation of a profile, events and other connections that include the formation of groups where information is exchanged and shared. Small Biz Nation, a group on LinkedIn, gives advice to small business owners from across the world and helps them make connections and receive insight from experts. Locally, LinkedIn members can search for local groups connected to Grimes, Johnston or Urbandale, or their area of profession, or create their own LinkedIn group. Other online sites such as Meetup and Eventbrite allow users to search in their area for events that may be connected to their business. In addition to networking groups, business development centers can also help entrepreneurs and give them advice on how to create professional connections. The U.S. Small Business Administration is available to help the more than 28 million small businesses within the country, and there’s an office in each state. Some of the administration’s programs help newer business owners connect with more experienced ones through online support groups. Business owners also can receive free consulting services and training programs at a reduced cost. Iowa’s Small Business Development Center helps business owners write plans, conduct market research, learn budgeting information and write a business plan through free, confidential, customized and professional services. Public speaking makes most people nervous, as do unfamiliar situations. Joining a networking group can help, and many networking groups are informal and sometimes discuss other topics in addition to business. Hummel, who joined the local BNI chapter DM-Des Moines, says he likes the fact that the group is made up of the same people who get together week after week. In Rotary, for example, members develop confidence and public speaking skills and have an opportunity to work on general people skills through the various activities in which members participate. Several networking groups often ask members to give a sales pitch and share information about their company or business. This gives businesspeople the opportunity to perfect their pitch and improve their public speaking and presentation skills. Business owners are also encouraged to bring a stack of business cards and give others who attend a reason to refer customers to their business. If you’re still unsure about whether to attend a networking event or meeting, read the agenda or event description. Those that are heavy on icebreakers and other activities may not be for everyone. Business owners can also create their own networking groups based on interests. Joining a networking group or attending professional events takes time and money. It requires you to be an active participant to get the most out of every opportunity, business people and group organizers say. Many networking groups have membership fees associated with them to pay for luncheons, speakers and for other operational expenses. Most groups provide a list of services members will receive with their membership fee or dues. The Central Iowa Business Group and Des Moines Business Group require members to attend at least 50 percent of meetings each year with the idea that attendance builds trust and networking opportunities. Members are also asked to give referrals to other members. BNI members are asked to carry around fellow members’ business cards and pass them out when they find someone who could use the products or services. Last year, members gave 7.7 million referrals nationwide that generated $9.3 billion in business, according to the organization’s website. Rotary and Kiwanis organizations have annual fees, part of which goes toward national dues and a service foundation.